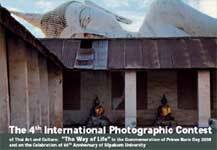 The 4th International Photographic Contest of Thai Art and Culture : " The Way of Life"
Silpakorn University, in cooperation with, the Photography Association of Thailand under the Royal Patronage of His Majesty the King and the Narisaranuwattiwongse Foundation pleasantly prepare to organize the 4th International Photographic Contest of Thai Art and Culture : “ The Way of Life ” in the Commemoration of Prince Naris Day 2008 and on the Celebration of 65th Anniversary of Silpakorn University in the coming year. This photographic contest is challenged and opened widely for the interested public, not only Thais but also all photograph lovers around the world can select and send their photographs in the concept of Thai art and culture : “ The Way of Life” to enter in the process of selection. Photographic entries are not restricted to any particular photographic or artistic technique and photographs may be taken with a standard film camera or a digital camera. Entries may be in color or in black-and-white. Send by Mail between February 14 – 20, 2008 to Public Relations Office, Office of the President Silpakorn University 22 Borommarachachonni Road, Talingchan District Bangkok 10170. Or delivered by Hand between February 20 – 22, 2008 ( including official holidays) : 9.00 a.m. – 4 p.m. at Lancharn Room, L Floor Office of the President, Silpakorn University (the same address above). For further information, please contact : Public Relations Office, Silpakorn University 22 Borommarachachonni Road, Talingchan District Bangkok 10170.